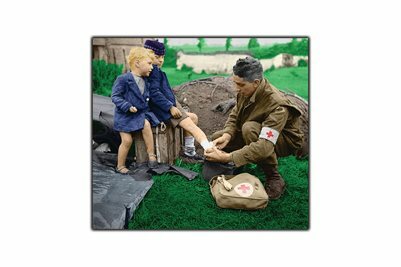 Lance-Corporal WJ Curtis of the Royal Canadian Army Medical Corps (RCAMC) bandages the burnt leg of a French boy whose brother looks on. On first look this seems to be a depressing picture. Two little boys living through the worst conflict our world has known, with one of them being injured and requiring medical attention. But as I coloured this picture I got a closer look, and I came to see it as inspiring. The boy with the burn doesn't look to be in pain so his injury probably isn't too bad. The blond boy looks excited. Is that a rock he's holding? His sling hanging down the crate he and his brother are sitting on? I kept imaging he was excitedly explaining how he was ready to fight the Nazis. And they're dirty. They look like they've been playing in the mud, getting dirt all over their clothes, legs, arms, hands and faces. I sure every mother will attest to how much little boys love to get dirty. Even in the darkest days, children will find a way to put a little joy in our lives.